Fresh purple iris in domain. It’s a crisp spring morning and the long crepuscular rays of sunlight hits the garden and creates a warm embrace. Fresh blooming flowers of iris and rose secrete the sweet scent of florals; these smells are unlike anything else, they are natural. After a light morning mist the smells take on an even stronger quality of verdant vibrancy. Green, dewey, saccharine and lavish, with just enough re-twang to not be too monoscented. The Hermessence ‘Iris Ukiyoé’ captures the scent of a subtle spring morning. It begins with an incredible combination of mandarin and iris without powder in sight. Orange mandarin and purple iris intermingle to replicate the dew and the sweet intoxication of blooming florals. A note of honey and rose give sweetness that works hand in hand to create the scent of the countryside. This fragrance creates the exact same phenomenon of pushing your nose deep into the petals of a pink rose next to a mandarin tree; with light mist (again). Because of this ‘wet’ character – Iris Ukiyoé could pass for an aquatic-ozonic cologne that is paramount for this particular scents extraordinarily realistic character. A little bit of bitterness comes through that it detectable at the back of the senses and permeates the nose; as you would expect from either rose or iris flower – or perhaps even orange flower and mandarin pith. The absence of orris root means there is no powderiness whatsoever. Often iris and orris root come as pairs and something to accept in these fragrances, and without it makes for a welcome change. Instead you get a purely sweet vegetable aroma. Simple, but devastatingly effective; like a haiku poem. The drydown welcomes more rose and a soft, fabric-softener quality that is soapy, intriguing and homey; pure impressionism. After approximately two hours this becomes a skin scent and sillage is moderate. Attuned for femininity, however completely unisex. It’s unique for men as there are totally no woods, no musks or nothing animalic about this; just light flowers and a feminine style of elegance. Daytime only. Alternatives (tricky question): Rose Ikebana by Hermès (more rose); Hiris by Hermès (powdery iris); and check out Les Exclusifs De Chanel. It’s like shoving your head in a bouquet of freshly picked flowers in the wet springtime. Not for me, however. 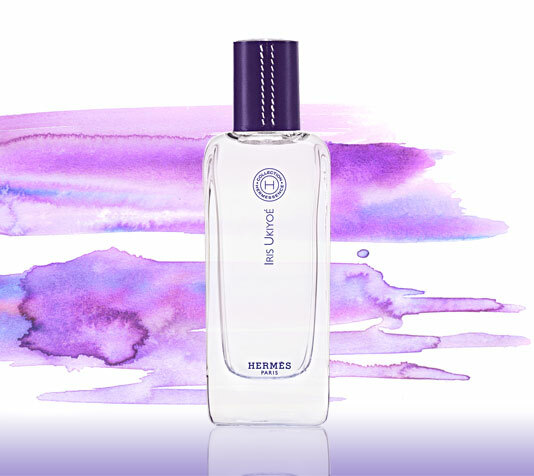 This entry was posted in Hermès and tagged Fragrance, Hermes, Hermessence, Iris ukiyoe. Bookmark the permalink.